The Method 1-Handle PosiTemp Shower Faucet Trim Kit from MOEN combines durability with affordability to polish off your contemporary bathroom buildout. A single-function showerhead spans 2-5/8 inch diameter and dispenses water at 2.5 GPM, furnishing ample rinsing and cleansing throughput. The lustrous brushed nickel finish is laden with a LifeShine protectant to guard against tarnishing, corroding or flaking, backed by a lifetime limited warranty for decades of dependable use. Part of the M-PACT common valve system, this kit makes it easy to substitute the trim without tweaking the plumbing should your future style preference change. A single lever on the faucet rotates 270 degrees to dial in your preferred heat intensity, held steady by a compatible PosiTemp pressure-balancing control valve. This trim kit requires MOEN valve 2510, 2520, 2570, 2580 or 2590 (not included) to complete installation. 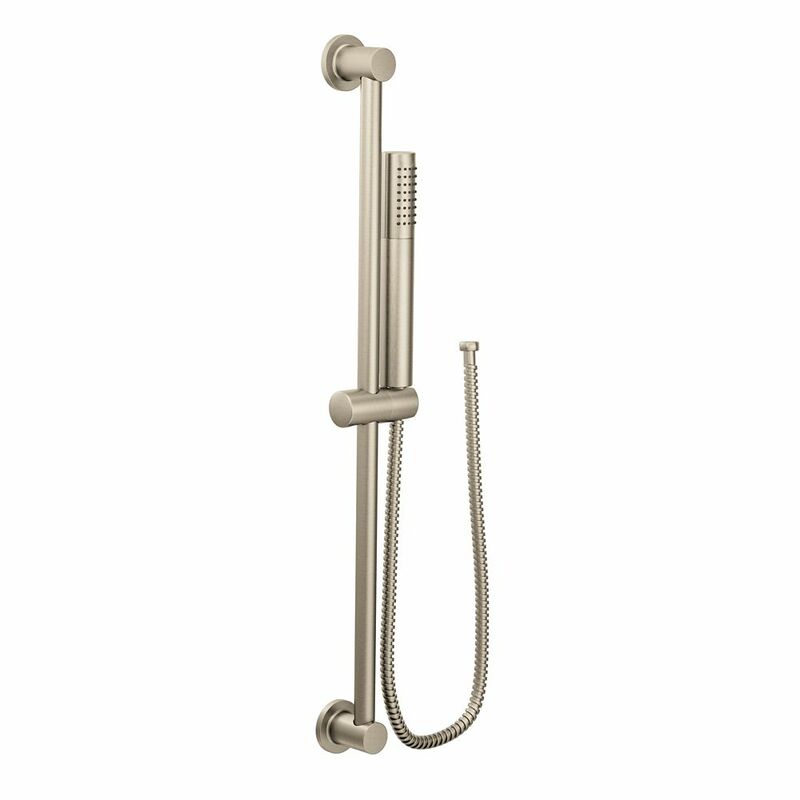 Brushed Nickel Eco-Performance Handshower From finishes that are guaranteed to last a lifetime, to faucets that perfectly balance your water pressure, Moen sets the standard for exceptional beauty and reliable, innovative design. Brushed Nickel Eco-Performance Handshower is rated 1.5 out of 5 by 2. Rated 2 out of 5 by RR from I'm on my second return, both of them leaked where the threads meet the body as if there's tiny p... I'm on my second return, both of them leaked where the threads meet the body as if there's tiny pinoles. NOT around the threads as I've tried different washers and teflon tape... hoping third time is the charm. Rated 1 out of 5 by HomeDepotCustomer from Plastic parts is not what I expected of the Moen... Plastic parts is not what I expected of the Moen Brand...too bad.